Over the two decades that I have been advising institutional clients on markets, I’ve experienced my fair share of extreme stock market volatility. This has included market crashes, stock price death spirals and short squeezes. During this time I’ve often witnessed whole analyst communities get blindsided by unexpected outcomes, rendering their forecasts and recommendations completely obsolete. I’ve also seen investors lose significant sums. Some of these outcomes may have been avoided by recognising a few simple mathematical concepts, namely Averages, Zeros and Non-Linearity. Understanding these three concepts, which as you'll see, can often be inter-related, can help you avoid the permanent loss of capital. Averages are a form of simplification. They can summarize a lot information into one key output. You'll often see market commentators reference an average to support a recommendation ... "Historically, the market has rallied/fallen x% when xyz happens." The danger in relying on averages is that the range of historic outcomes may be very wide; the range may contain a zero, or the future outcome may end up being far outside those historic outcomes. It's also quite likely the outcome will be nowhere near the historic average. "In one respect, 2004 was a remarkable year for the stock market, a fact buried in the maze of numbers on page 2. If you examine the 35 years since the 1960s ended, you will find that an investor's return, including dividends, from owning the S&P has averaged 11.2% annually. But if you look for years with returns anywhere close to that 11.2% - say, between 8% and 14% - you will find only one before 2004. In other words, last year's 'normal' return is anything but." Whenever I hear references to an 'average', I remind myself of the story of the 6-foot man who drowned crossing the river that was, on average, 5-feet deep. Another limitation of averages is that the future might look a lot different to the past. Billions of dollars were lost in the Global Financial Crisis as people relied on the notion that`On a national basis, US house prices never go down'. Never forget that absence of evidence is not evidence of absence. As an investor you must structure your portfolio to cope with the unexpected. This means stress-testing individual ideas and the assumptions that underpin them and taking the time to think about what a worst case scenario might do to each position and the portfolio as a whole. Averages also mask historic outcomes that resulted in zeros. Regardless of the potential return, if there is a possibility of a complete loss, investors should steer clear. And, as we saw above, history may not be a good guide to the future. To manage that risk requires creative thinking, consideration of potential alternative outcomes and acknowledging worst case scenarios. As Warren Buffett noted above, a common cause of investment ruin is leverage. I've seen plenty of over-leveraged companies turn into zeros. It's no wonder the Investment Masters generally steer clear of companies with lots of debt, lack transparency or that are difficult to understand. Humans are wired to think in a linear fashion. Most things in life work that way, but we often fail to see the potential for non-linear outcomes. But in markets small changes can have large impacts on outcomes. Sometimes things don't work in a linear fashion. Get our PDF study on REITs and our other investor studies! Save it to your desktop, read it on your tablet, or email to your colleagues. "I am a little perplexed when people are surprised by large market moves. Oftentimes, it takes only an unexpected supply/demand imbalance of a few percent and changing sentiment to dramatically move markets. We have seen that condition occur recently in oil, but I have also seen it multiple times in my career in cotton, corn, aluminium, soybeans, chicken, beef, copper, iron – you get the point. Each industry or commodity has continually changing supply and demand, different investment horizons to add or subtract supply, varying marginal and fixed costs, and different inventory and supply lines. In all cases, extreme volatility can be created by slightly changing factors. It is fundamentally the same for stocks, bonds, and interest rates and currencies. Changing expectations, whether around inflation, growth or recession (yes, there will be another recession – we just don’t know when), supply and demand, sentiment and other factors, can cause drastic volatility." Over the years I've witnessed numerous events cause unexpected negative outcomes due to non-linearity. Here are a few ..
High Fixed Operating Cost Businesses - when businesses have high fixed operating costs and low profit margins, small changes in top line revenue can have a huge impact on a businesses profitability. When sales are booming this is a great benefit, but when things turn down, profit can disappear quickly. Highly Leveraged Businesses - when businesses carrying a lot of debt turn down, profit can disappear quickly. While the value of the enterprise might decline by 50%, if the business is 50% geared it means the equity is wiped out. These can be very profitable short candidates..
Commodity Companies - Analysts often expect supply and demand curves to be linear. Often they are not. A good example was when China entered the iron ore market in the early 2000's. 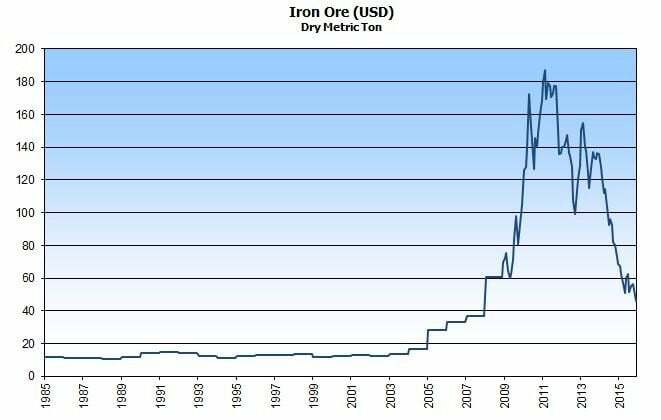 The chart below shows a stable iron ore price from c1985 until 2009 when a supply bottleneck saw prices spike dramatically. Analysts expected the iron ore to be supported by the high Chinese marginal cost of production post c2012. Huge increases in supply and large debt loads that needed to be serviced saw iron ore prices collapse as the supply and demand curve proved non-linear. Peter Brandt, a CTA since 1976, summed it up nicely in regards to commodities trading below costs ... "But, you might say, this kind of drop is impossible because producers must make money. Who says?? Markets in supply surplus tend to go the production price of the most efficient producers. Plus, who would have ever believed when Crude was at $148 in mid-2008 that prices would retreat to below $40 in just six months. So take your pet macro-economic/fundamental scenario and burn it with the trash!" Non-linear outcomes can lead to extreme events, also know as 'tail risks'. They too, don't show up in past averages. 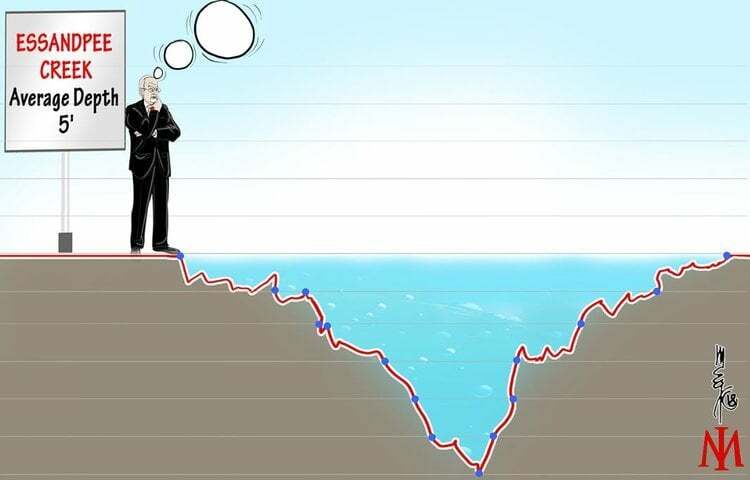 Having an understanding and awareness of the possibility of non-linear outcomes can better prepare you and your portfolio for success in the markets. I particularly like the anecdote about the six foot man to explain most of this. Consider that if the average depth of the river he wanted to cross was 5', and the shallowest depth was 0', the deepest part of the water could be well in excess of his 6' height. Which is why he drowned. The message is don't rely on averages. Or expect that all things will conveniently follow a straight line. Buffett's comment that the market's returns bore a resemblance to the average in only one year across the 35 years he was reviewing, is quite simply, astonishing. And let's face it, who wants to drown? Or suffer a permanent loss of capital?